Ronda is home to approximately 35,000 inhabitants and is located one hundred kilometres to the west of the city of Malaga and the airport. Ronda is a tourist hot spot located seven hundred and fifty metres above sea level in a mountainous area on the Costa del Sol in Spain. Ronda is situated on the banks of the Guadalevin River and sits on top of a one hundred metre high canyon known as the El Tajo Canyon which gives the city some spectacular views across the countryside. Are you an expat in Ronda? What do you like/dislike about it? Let us know in the comments box at the bottom of the page. Ronda dates back to prehistoric and the Neolithic age and has played an important role through the ages during Roman times, the Islamic Occupation, Spanish Inquisition, Napoleonic Times and during the Spanish Civil War. The city of Ronda is steeped in history. Nowadays tourists come to Ronda to see the Three Bridges in Ronda which are the Puente Romano (Roman Bridge), Puente Viejo also known as the Arab Bridge and the Puente Nuevo or new bridge which spans the canyon. Also worth visiting are the almost fully intact Arabic bathhouses which are located below the city and date back to the thirteenth and fourteenth centuries. The Corrida Goyesca takes place once a year in the Plaza de Toros de Ronda, which is the oldest bull fighting ring in Spain. Less then thirty minutes away by car from the city of Ronda is the Cueva de Pileta which is a cave with 25 000 year old paintings. For some authentic Ronda flamenco shows you need look no further than the Peña Flamenca Tobalo which is located on the Calle Toma. There are also guided tours of Ronda from Malaga such as the Organic Olive and Wine Tour from as little as €40 per person. For more information you can look at http://www.viator.com. Ronda weather is much like that of the coastal resorts such as Fuengirola and Torremolinos although the summer weather is approximately five degrees cooler than at the coast while winters are cool and snow is not unheard of. You can see the latest weather on our Ronda webcam page. If you wish to stay overnight in Ronda then you have fifty hotels to choose from. Ronda hotel rooms start from as little as €12 a night and the most recommended and reviewed hotels according to the Trip Advisor includes the Hotel La Fuente De La Higuera, Hotel Ronda, Hotel Vera de los Banos, Hotel San Gabriel and the Hotel La Cazella. Ronda isn’t big when it comes to its nightlife. Most of the nightlife activities can be found in bars such as Limbo, La Farola, O’Flaugherty Irish Bar and Faustino. Siete de Copas, El Choque Ideal, Sabor Latin and Huskies are good for live sports and evening entertainment such as jazz and salsa dance classes. The two main night clubs to dance the night away in Ronda are Kopas and Avalon. Ronda has some very good quality restaurants which are reasonably priced and often have fantastic views to drink in while enjoying a sumptuous meal. Worth mentioning as they have been reviewed by visiting tourist to Ronda are Meson El Sacristan, De Locos Tapas, Puerta Grande, Almocabar, Traga Tapas, Restaurante Goyesca, Restaurante La Carreta, Meson Rondeno, Carmen de la Ronda and Faustino. If you are visiting the city in September you will be able to see the spectacle of the Feria de Pedro Romero. Ronda is not an easy destination to get to. If you have hired a car you will need a lot of nerves as there are some very steep and windy roads. The journey time by car from Malaga to Ronda is approximately an hour and forty five minutes. 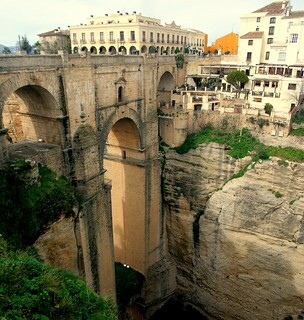 Ronda is easily accessible by train from the city of Malaga with a journey time of two hours and a small cost of €12. There are also several buses daily from Malaga to Ronda. Ronda is a great pace to explore while on holiday on the Costa del Sol. Whether you’re looking for a place to rent or to stay at permanently, you can take advantage of the services from the real estate agents in Ronda who are more than willing to help you in finding your ideal residence. You can contact Inmobiliaria Ronda (inmobiliariaronda.com, Tel. +34 982 254 025) and FINCASA (www.fincasaronda.com, Tel. +34 952 161 324 and +34 628 324 270).